Growing demand for lightweight materials for automotive and aircraft components and escalating demand for wind energy is anticipated to drive the global composites market for the next few years. With the growing need for lightweight and high strength material in automotive, aerospace, and wind mill applications; demand for carbon fiber is constantly increasing. This is due to the exclusive properties of carbon fiber such as high tensile strength, stiffness, and temperature tolerance and low thermal expansion and weight. However, the expensive nature of carbon fiber is restricting its use in many applications. Carbon fiber composites currently cost nearly four times the cost of steel. Therefore, reducing the price of carbon fibers is likely to offer lucrative opportunities for composite manufacturers. Owing to these reasons, the global composites market is expected to surge at a CAGR of 8.9% between 2017 and 2025 to reach a valuation of US$101.88 bn by the end of 2025 from US$47.32 bn in 2016. Composites market is segmented on the basis of product as polymer matrix composite, metal matrix composite, and ceramic matrix composite. In terms of value and volume, polymer matrix composite segment dominated the global composites market in 2016. It accounted for more than 95% volume share in 2016. Metal matrix composites offer some advantages over the polymer matrix composites such as greater resistance to degradation by organic fluids and higher operating temperatures. These composites are also more expensive and therefore offer restricted usage. Ceramic materials are naturally resistant to oxidation and deterioration at raised temperatures. Automotive and transportation, construction, aerospace and defense, electrical and electronics, marine and oil and gas, wind energy, and others. Of these, the automotive and transportation application segment held more than 25% volume share in the global composites market in 2016. On the other hand, the aerospace and defense is another application segment which held relatively significant share in the global composites market in 2016. Composites also provide greater flexibility because the material can be tailored to meet the design requirements and because they offer significant weight advantages. Composite materials used in aircrafts are generally reinforced fibers or filaments embedded in a resin matrix. In terms of technology, layup process segment generated high sales in 2016. However, it is anticipated to lose its market share by 2025 on account of the growing demand for low-cost manufacturing processes. North America dominated the global composites market and held nearly 40% volume share in 2016. Asia Pacific is the anticipated to witness a CAGR of 9.0% by volume and likely to remain an attractive market for composites. This is on account of rapidly developing technological advancements and the adaptation of composites in applications such as automotive and wind turbine blades. Europe being a major manufacturer of premium cars, is an attractive market for composites. On account of the increasing use of composites in next-generation aircrafts, the aerospace segment in Europe is predicted to offer lucrative opportunities witnessing a CAGR of 8.6%, during the forecast period. Some of the key players in the composites market include Toray Industries, Owens Corning, Teijin Limited, Hexcel Corporation, TPI Composites, Inc, Faurecia, Performance Composites Inc., Enduro Composites, Inc., KINECO, APPLIED POLERAMIC INC., Hexagon Composites, Creative Composites Ltd., and HITCO Carbon Composites, Inc.
Composite is a multiphase material exhibiting a significant properties of both constituent phases. It consists of a continuous phase called matrix and a dispersed phase reinforcement. It is commercially available in different product types such as polymer matrix composite, metal matrix composite, and ceramic matrix composite. In terms of application, automotive & transportation and aerospace & defense held majority share in the global composites market in 2016. Rising demand from these end user industries is anticipated to fuel the composites market during the forecast period. This study analyzes, estimates, and forecasts the global composites market in terms of volume (Kilo tons) and revenue (US$ Mn) from 2016 to 2025. The report also analyzes several driving and restraining factors and their impact on the market during the forecast period. The report provides a detailed view of the composites market based on applications. Key applications included in the report are automotive & transportation, construction, aerospace & defense, electrical & electronics, marine & oil & gas, wind energy, and other (consumer goods, etc.). In terms of technology, the market is segmented into: pultrusion process, layup process, filament winding, compression molding, injection molding, resin transfer molding, and others. In terms of product type, the market is segmented into: polymer matrix composite, metal matrix composite, and ceramic matrix composite. Furthermore, the report segments the market based on key geographies such as North America, Europe, Asia Pacific, Latin America, and Middle East and Africa. It also provides market volume and revenue for each application, technology and product type under every regional segment. The composites market is further analyzed into major countries of each region. Based on applications, technologies, product types and countries, the report analyzes the attractiveness of each segment with the help of an attractiveness tool. The study includes value chain analysis, which provides a better understanding of key players in the supply chain (from raw material manufacturers to end-users). Additionally, the study analyzes market competition and industry players using Porter’s five forces analysis. Primary research represents the bulk of our research efforts, supplemented by an extensive secondary research. We reviewed key players’ product literature, annual reports, press releases, and relevant documents for competitive analysis and market understanding. Secondary research includes a search of recent trade, technical writing, internet sources, and statistical data from government websites, trade associations, and agencies. This has proven to be the most reliable, effective, and successful approach for obtaining precise market data, capturing industry participants’ insights, and recognizing business opportunities. Secondary research sources that are typically referred to include company websites, annual reports, financial reports, broker reports, investor presentations, and SEC filings, internal and external proprietary databases, and relevant patent and regulatory databases. Other sources include national government documents, statistical databases, and market reports, news articles, and press releases and webcasts specific to the companies operating in the market. Secondary sources referred for the study of the composites market include Reinforced Plastics Magazine, European Plastics Council, Compositesone, Composites World Magazine, etc. and company presentations. 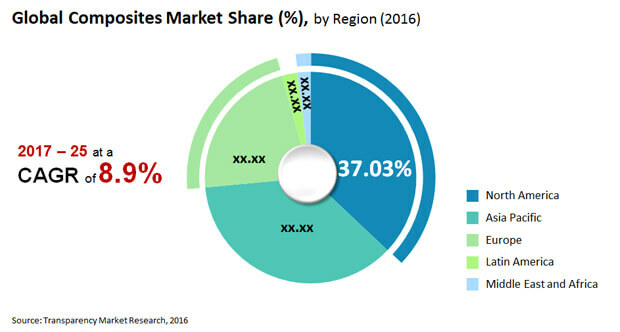 The report includes an overview of the market share of key companies in the global composites market. Key players profiled in the composites study include Hexcel Corporation, TPI Composites, Inc, Owens Corning, Teijin Limited, Faurecia, Performance Composites Inc., Enduro Composites, Inc., Toray Industries, APPLIED POLERAMIC INC., Hexagon Composites, KINECO, Creative Composites Ltd., HITCO Carbon Composites, Inc., The Quadrant Group of Companies, Kangde Xin Composite Material Group Co., Ltd., BGF Industries, Inc., FACC AG, Premium Aerotec, Fokker Aerostructures, COTESA GmbH, PLASAN CARBON COMPOSITES, Wethje Carbon Composites, VELLO NORDIC AS, Fiberdur GmbH & Co. KG, Akiet B.V., and FILL GESELLSCHAFT M.B.H.